Central Alsace Barr. Our style furnished 63 m2 in private house owners. You will find comfort and charm Christian and Michèle welcome you with a smile in this furnished that the stamp and its small very flowery courtyard, you will feel at home. Possibility: Breakfast on request. The rental has two main rooms, a bedroom LOUIS XV with 1 bed for two people 1 wardrobe chatelaine 1 secretary 2 padded chairs and two extra beds, a living room LOUIS XI with a sofa 3 seats 2 chairs 1 coffee table 1 table half-round 1 desk and 1 chair armchair with color television and built-in DVD player and paintings on the walls that can be sold. Beside an Alsatian dining area and since May 2017 a brand new Schmidt kitchen well equipped with a dishwasher, an electric oven programmable a hob of 4 gas burners, cutlery crockery and glasses in sufficient quantity and not offsuit. a cooking robot coffee maker, 1 kettle, 1 refrigerator, 1 freezer, 1 washing machine, 1 dishwasher, 1 intercom. The WC is independent. The bathroom has also been improved by the kitchen designer Schmidt and outside, you get a private garden furniture and a bike and ski storage in a courtyard with trees and flowers. 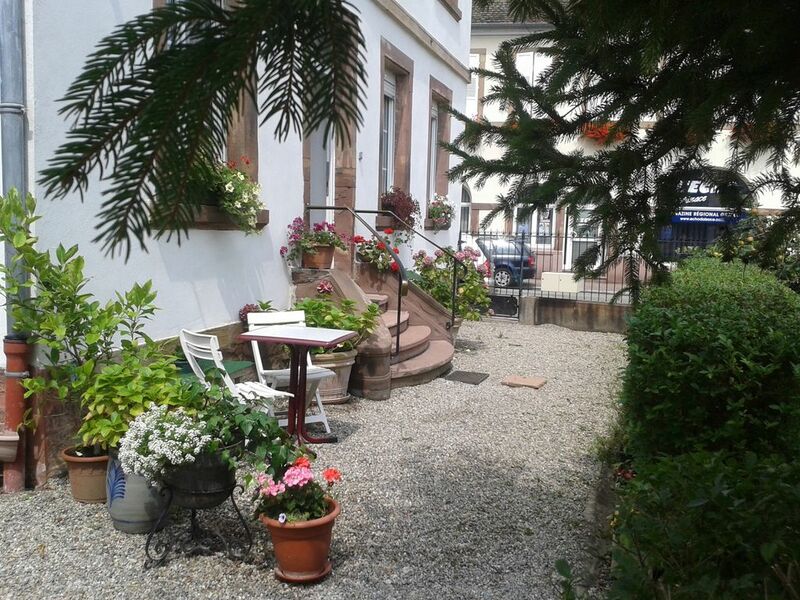 The position of our seasonal rental in Center Alsace, so in the heart of Alsace, gives you many possibilities of visits and excursions. A deposit of 200 euros will be required at the entrance of the place, it will not be cashed. Sheets and linen are not included in the rental price. However, they can be provided for the sum of 40 € per week. The cleaning of the furnished must be done by the tenant and the house must be left in perfect state of cleanliness. However we offer a final cleaning service at a price of 70 €. Schönes Haus nicht weit vom Zentrum Barrs entfernt, einem reizvollen kleinen Städtchen. Im Herzen des Elsass gelegen, perfekt für Ausflüge zu den zahlreichen Sehenswürdigkeiten. Die Location war mit allem ausgestattet, was man braucht. Sehr sauber und gemütlich eingerichtet. Auch für Kinder bestens geeignet. Monsieur Charge war ein überaus freundlicher und stets hilfsbereiter Gastgeber. Wir haben den Aufenthalt in Barr sehr genossen und kommen gern wieder! Wir haben die Zeit sehr gnossen.Es war alles da und wir wurden wir wurden von Christian Chargeverwöhnt.Vielen Dank. Die Lage der Wohnung istperfekt,um den Elsass zu erkunden. L'appartamento è dotato di tutti i comfort, comodo e accogliente. La descrizione e le foto corrispondono perfettamente. I proprietari sono molto gentili e disponibili. Ci hanno fatto trovare un dolce tipico al nostro arrivo e per capodanno una bella sorpresa con un dolce bello e ottimo. Barr é in una posizione ideale per visitare l'Alsazia é, Europa Park. Da consigliare sicuramente! Enjoy your stay 'at Christian & Michèle' to go walk the medieval city of Barr and discover through the cobbled streets, beautiful houses typical half-timbered in Alsace, with their courtyards and flowered balconies, and discover our beautiful Hotel city ​​of the twelfth century, the museum of the Folie Marco, the main street and its windows Artisans, follow the river running through the city "Kirneck". Visit a winery and enjoy in moderation wonderful local wines. Practice the marked trails that will lead you to the ancient castle overlooking mountains. La caution payée à l'arrivée par un chèque qui vous sera rendu au départ de votre séjour. Si vous désirez un contrat de location en lieu et place du paiement en ligne, vous devez transmettre vos coordonnées postales, vos N° de téléphone fixe et portable et définir vos dates d'arrivée et de départ ainsi que le nombre de personnes. Le propriétaire vous enverra deux contrats de locations dont un que vous renverrez signé avec les arrhes.